With the development of the Indian Premier League and the World Cup in 2011, India is now confirmed as one of the most significant players in World Cricket. In 2007 the Maharashtra Cricket Association commissioned Hopkins Architects to design a new 57,000 seat stadium in Pune, 170km south-east of Mumbai and 800m above sea-level on the Deccan Plateau. 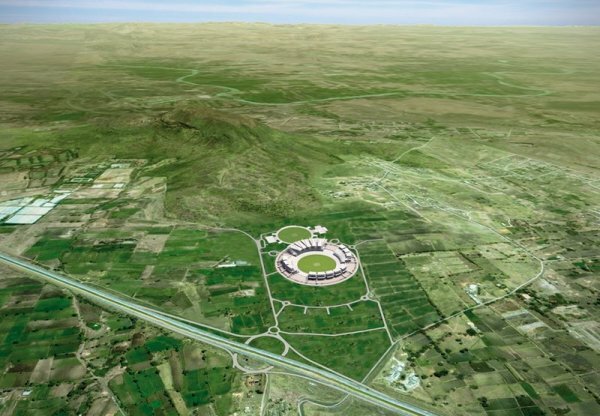 The site, located next to the Pune-Mumbai Expressway just outside Pune, enjoys dramatic 360-degree views of mountain ranges; it also slopes over 15m from north to south. By rebalancing the levels with cut-and-fill we created a deep bowl of terraced seating for 34,000 spectators centred on the 15 pitch Match Ground. This initial move helps to create a new "place" around which development can grow. 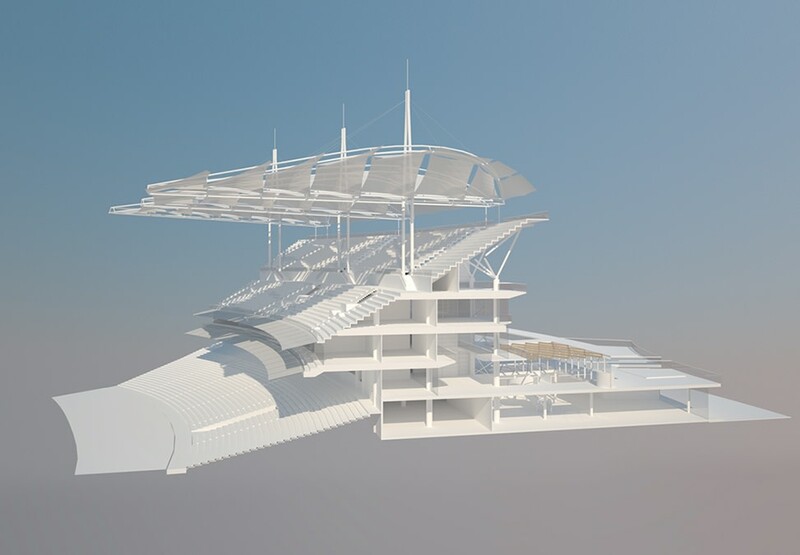 The lower terrace, accessed by means of a wide pedestrian perimeter concourse, is then surmounted by four stands, the gaps between them providing views to the surrounding landscape in addition to good airflow and daylight to the playing surface. 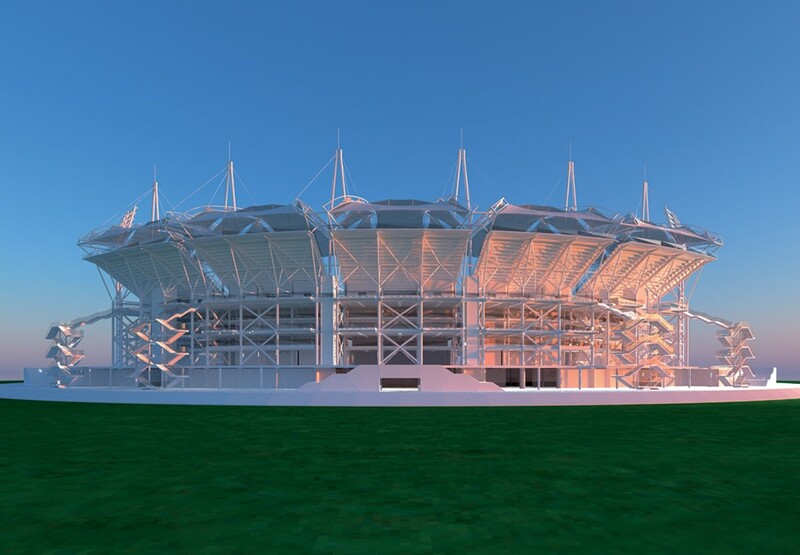 The stands will include upper terrace seating for a further 21,000 spectators, a Members' Pavilion and up to 80 hospitality boxes. A Media stand for TV/Radio broadcasting and up to 250 journalists will be located opposite the Members' Pavilion at the northern end. Spaces for 2,000 cars and up to 10,000 two-wheeler spaces will be provided on the outlying fields for major matches. Cricket is played in India mostly from November until late May: the sun is thus relatively low during play and in Pune, the game does not have to suffer monsoon rains. Consequently the roofs to the stands could be designed to maximise shading for spectators in addition to allowing for good airflow under and around them through the use of a composite steel and tensile membrane structure. 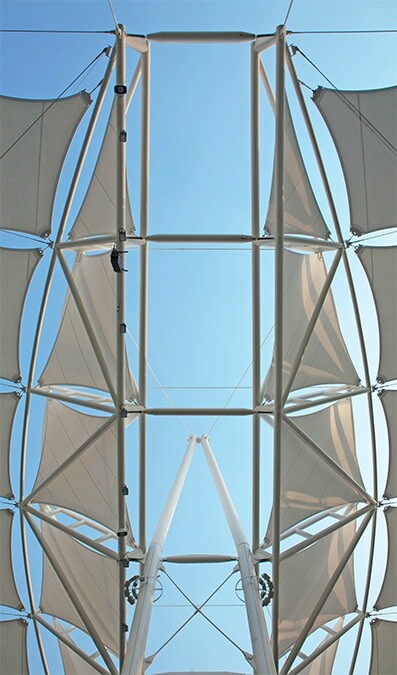 Relatively small-scale panels of PVDF coated PVC fabric set within a lightweight steel structure of booms and trusses thus provide a memorable signature for the Stadium. The predominantly steel and concrete stands rely on a complex braced structure within this seismic region of India. Usually grounds develop organically, subject to city centre constraints and compromises. 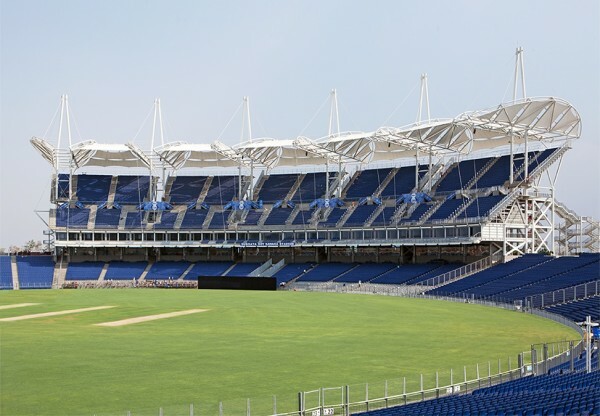 Here we are able to model an international ground from scratch, offering not only the perfect setting for the MCA and the IPL team, the Pune Warriors India, but also an excellent base for future facilities. 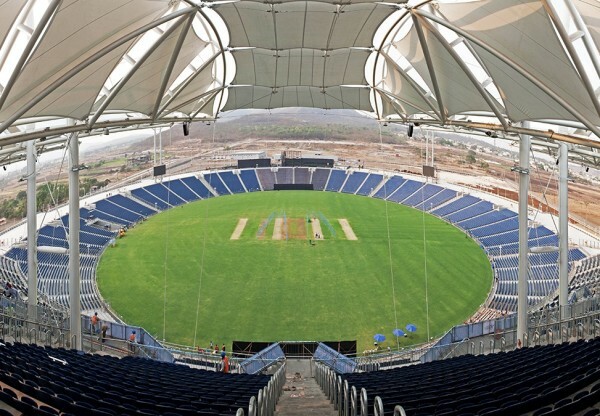 The first phase of the project, the Members' Pavilion opened in late March 2012 for the IPL season and in addition to Pune Warriors matches, hosted an ODI England vs India match in December 2012.